On Monday the US Senate finally passed Senator Marco Rubio’s bill calling for sanctions on Maduro government officials accused of human rights abuses. The bill’s passage follows Republican electoral victories that will lead to their taking over the Senate in January, as well as recent statements from the Obama administration that softened their opposition to such legislation. This bill has always had more support in the House and it should quickly move through and find its way onto President Obama’s desk. After my May Washington Post op ed arguing that sanctions would be counterproductive, investigative journalist Steven Bodzin “Setty” (see his indispensable blog here) presented a challenge that is worth considering. With characteristic blogger diplomacy, Setty wrote. This seems like a reasonable request, so let’s take a look at the actual evidence regarding the cases Setty mentions. First, was response to the May 2011 sanctions –imposed in response to Venezuelan fuel sales to Iran in defiance of U.S. sanctions on that country – muted? I think they actually led to some pretty significant government mobilization. (See Reuters’ English language coverage here.) Here is a summary of the government response. For its part the National Assembly loudly passed a resolution rejecting the sanctions. When opposition legislators voted against it or abstained, then President of PDVSA Rafael Ramirez accused them of treason. Ramírez also suggested that the US, in sanctioning Venezuela for its cooperation with fellow OPEC member Iran, was seeking to divide OPEC. 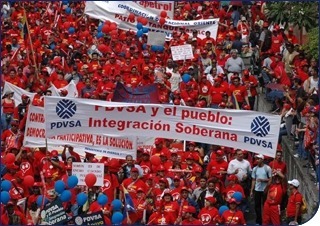 Perhaps more importantly, Ramirez was able to get PDVSA workers to mobilize against the sanctions in the “Great March for Sovereignty” (see photo above). Such unifying mobilizations must have been welcome within PDVSA’s management circles since during this period there was considerable discontent within PDVSA regarding an enormous case of fraud in PDVSA’s pension system. But the issue of sanctions for the most part pushed that aside. Regional ally Ecuador also spoke out against the sanctions. Probably the strongest evidence for Setty’s challenge actually came not from these cases but from sanctions announced after he wrote his post. On July 30, the US State Department announced they were revoking the visas of unnamed Venezuelan officials. This indeed led to a relatively muted response on the part of the Maduro government. Elias Jaua said “we understand that these aggressions are the desperate cry of people who know the world is changing but have no other way of relating [to other countries].” I can’t find evidence that Maduro even mentioned them. However, it should be noted that this round of sanctions was a “light” version of the Rubio bill, only revoking the visas of unnamed government officials. Indeed Rubio immediately commended the measure but said it was not enough and that he would push ahead with his bill which takes the more aggressive measure of freezing assets and approving funds for communications media in Venezuela. So the evidence is mixed. The response to the July 30 sanctions was clearly muted. The response to the September 2008 sanctions was conflated with a nationalistic push that was already underway. The response to the 2011 sanctions on PDVSA, however, strikes me as a textbook case of a US foreign policy measure provoking a vigorous nationalist response that strengthened the government and allowed it to distract attention from its own problems. Of course just what amounts to a vigorous or muted response depends on your point of view. These responses can certainly be thought of as political theater. However, as a sociologist I do not consider theater superfluous or contrast it to “real” measures. Rather, political theater is a form of politics. It focuses attention and provides an interpretation of social and political relationships that can then be used across multiple contexts. It defines the social and political world and provides points of common reference for members and followers of the government which in turn affect their discussions and their actions. What can be said is that the period in which the US Administration or the Congress have threatened or put forward targeted sanctions, from September 2008 to the present, has been a period in which there has been increasingly poor relations with the US, increasing radicalization in Chavismo, increasingly poor government performance, and decreasing quality of life for Venezuelans. Of course it is difficult to determine cause and effect; it would be simplistic to affirm that targeted sanctions have been the leading factor in this deterioration. But we can say that these sanctions have contributed to a process in which Venezuela’s politics has increasingly turned inward on itself. They do this through the following mechanisms. Officials targeted by sanctions become even more loyal as they see their future tied to the survival of Chavismo. Portrayals of foreign conspiracy mean any pluralism that exists within Chavismo is reduced in favor of unity. Sanctions provide the population with evidence for Chavismo’s continual flow of international conspiracy theories. They allow the government to portray the opposition as dangerous traitors at a time of external threat. They lead regional allies to circle the wagons around Venezuela in the face of foreign aggression. As is often the case, events in Venezuela evolve faster than I can write about them. Yesterday I sent this piece off to some colleagues for feedback. By the time I got it back, Maduro had already spoken out about the sanctions. If you watch this video of yesterday’s speech from 1:55 you can get a feel for the impact this sanctions measure will have in Venezuelan politics. The sanctions are embedded in a narrative of international conspiracy; Venezuela’s response is embedded in a nationalistic historic narrative that unifies people and government; and sanctions are used to portray the opposition as controlled by the US. Below is an English translation of his comments. There is US imperialism conspiring every day. Yesterday the US Senate, insolent US senators, insolent imperialists in the Senate approved a resolution to supposedly sanction Venezuela. Who is the Senate of the United States to sanction the Fatherland of Bolivar? We don’t accept sanctions insolent imperialists! You need to learn to respect the Fatherland of Bolivar. We are the descendants of Ayacucho! Of Carabobo! We are the children of Bolivar. We are the children of Chavez. Indignation and repudiation is what our people feel. Indignation and repudiation in the face of threats from the White House. [They’re] desperate because we have defeated them in 2014 and we are going to continue to defeat their puppets, the neofascism of the right that are salaried puppets of US interests. Being desperate, they want to challenge Venezuela with sanctions and threats. It the craziness of sanctions prevails, Mr. Obama, it’s not going to turn out well for you. Because he who pushes the button of patriotism of Venezuelans of Latin Americans, is playing with history, President Obama. President Obama, recover you equilibrium regarding Venezuela. Because the Bolivarian revolution of Comandante Chavez, won’t let itself be scared by sanctions, nor by sanctions promoted by the lobby, these sanctions are promoted by the Venezuelan right wing lobby.